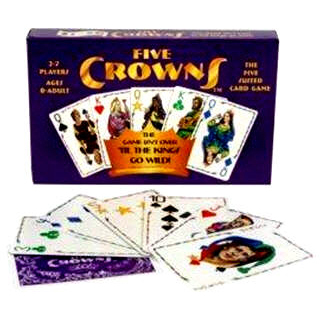 Five Crowns® is a card game for the whole family. It has original game play, but uses skills that you have obtained from playing your old favorites like Hearts, Spades, and Rummy. Because Five Crowns has five Royal Families -- the Stars, the Clubs, the Hearts, the Spades and the Diamonds -- yes, five suits in the old usage, it allows a more equal chance of making a book or a run, effectively giving each player more possibilities to readjust their hand so as to go out. The play starts with 3 cards and threes are wild; next hand has 4 cards and fours are wild....working up to the last hand when Kings are wild. Each one of the Royal Families is portrayed in original art and has its own colors. Five Crowns is a fast paced, ingenious new game in eleven rounds. Ages 8 & up. 2-7 Players.